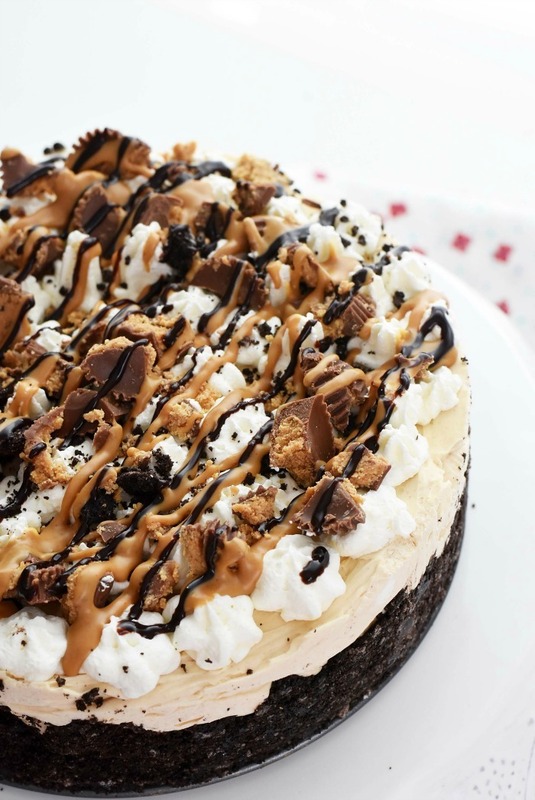 Home » Recipes » Perfect No Bake Peanut Butter Cheesecake (With Oreo Crust)! 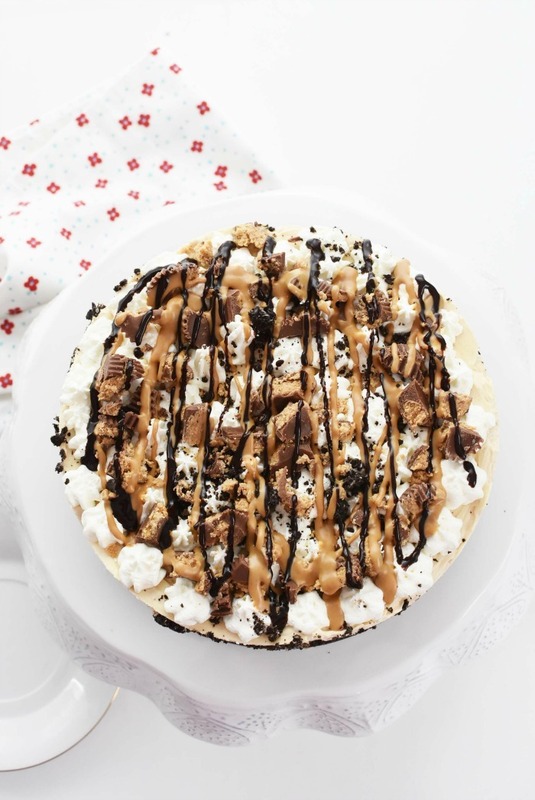 Perfect No Bake Peanut Butter Cheesecake (With Oreo Crust)! 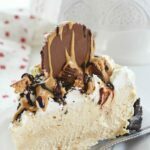 You’ll love this No Bake Peanut Butter Cheesecake! It features a rich and creamy peanut butter filling inside a thick and crunchy Oreo crust. 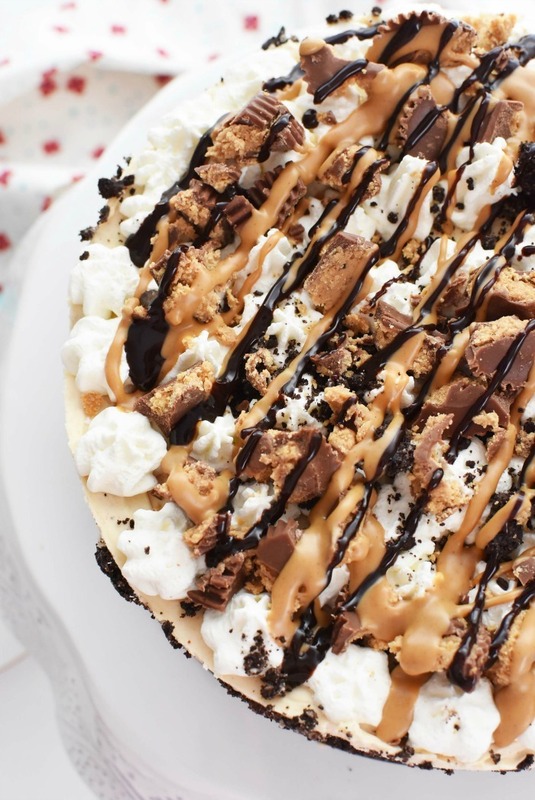 This easy cheesecake is topped with real whipped cream, peanut butter cups, chocolate and caramel drizzle. This is the best no bake dessert ever! I’m always in the mood to bake a delicious cheesecake. My Crustless Cheesecake with Strawberries and New York Style Pumpkin Cheesecake recipes were huge hits. This time I decided to try something a little different… a No Bake Cheesecake! For my No Bake Cheesecake, I thought it would be fun (and yummy) to make it a peanut butter cheesecake with an Oreo crust! How delicious does that sound? You’ll have to try it to see for yourself (you’ll be in LOVE)! To make a cheesecake that doesn’t require baking, there are a few things you will need. A 9″ springform pan is a must! I suggest buttering the inside to prevent the cookie crumbs from sticking. This will allow for much more even slices. You will also want your cream cheese to be room temperature. When I first started making cheesecakes, I never realized how important this step was until I made a cheesecake with lumps! When your cream cheese is room temperature it is easier to work with and provides a light and fluffy texture. So you made a no bake cheesecake but it was mushy and more like “fluffy” pudding versus, ice cream cake texture? Here is what probably went wrong- You did not allow it to chill long enough! The key to a no bake dessert is to make sure the chilling period is sufficient. If it is not, your dessert will be soft and mushy. This no bake cheesecake requires a minimum of 4 hours to chill. However, for best results making it a day ahead is best! This allows the cheesecake to firm up perfectly. To serve, simply allow it to thaw for 30 mins and then slice into it with a warm knife. To decorate your no bake cheesecake with sauces and candy, you’ll need to make sure it is fully frozen. Once hardened, remove the cake from the freezer, take off the springform pan band and place your cake on a serving platter or cake stand. Decorate it with crushed peanut butter cups, chocolate, and peanut butter sauce. Making peanut butter sauce that freezes like a magic shell is super easy. Simply place creamy, full-fat peanut butter into a microwave-safe dish. Microwave for 30 seconds. Once done, stir and drizzle over the top of the FULLY FROZEN cake. Get the printable full instructions below! 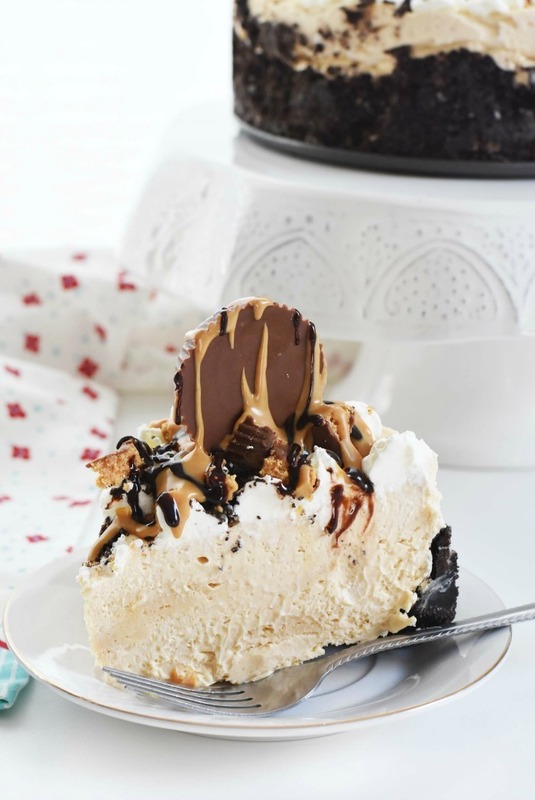 You’ll love this No Bake Peanut Butter Cheesecake! 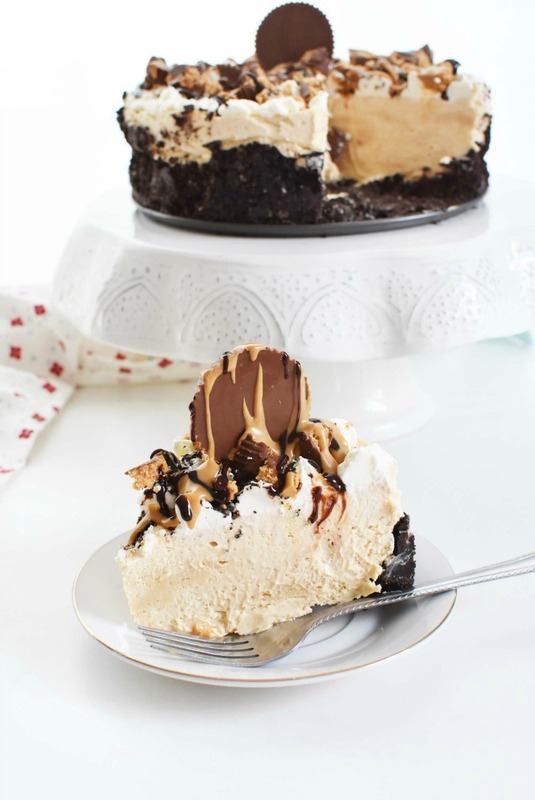 It features a rich and creamy peanut butter filling inside a thick and crunchy Oreo crust. 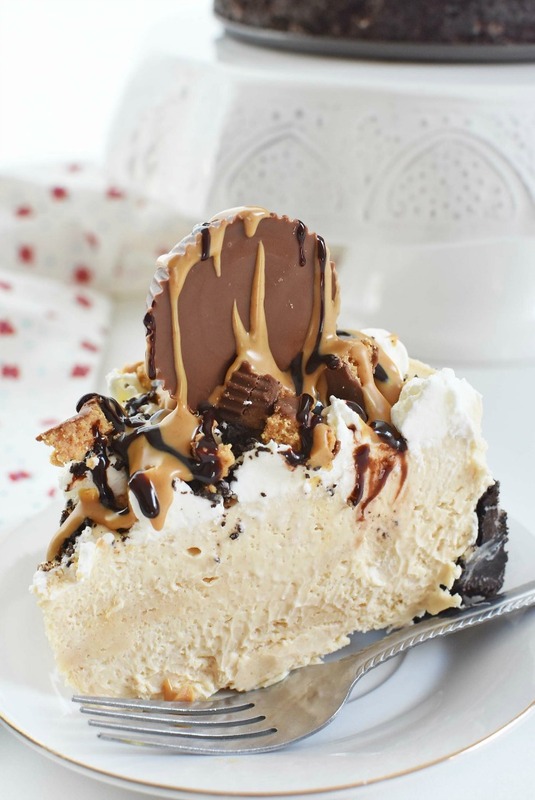 This easy cheesecake is topped with real whipped cream, peanut butter cups, chocolate and caramel drizzle. Using a food processor, crush 1 package of Oreos until coarse crumbs form. Combine cookies with melted butter. Line a 9″ greased springform pan with crushed Oreos and butter mixture. Press the mixture into the bottom and along the sides of the pan- set aside. In a large bowl add room temp. cream cheese and cream using a hand mixer. Slowly add in the confectioners sugar. Once combined and creamy whip in the peanut butter; set aside. In another mixing bowl, add ALL the heavy whipping cream, and whip for 42-4 minutes until stiff peaks form. Once cream is fully whipped, fold in all but ( 3/4 cup) into the PB & cream cheese mixture. You will want to go gentle and use a rubber spatula to combine it. Once fully combined, pour mixture into the Oreo lined springform pan. Smooth mixture with a rubber spatula. Place remaining whipped cream in a piping bag, and pie on stars. Top with crushed peanut butter cups, chocolate, and peanut butter sauce. Cover springform pan with plastic wrap and place in a deep freezer for 4-6 hours to fully firm up. Once fully firm, coat with melted peanut butter, peanut butter cups and chocolate. To serve, use a heated knife. Place leftovers back in the freezer. OMG, that looks amazing! I mean, it looks straight out of a restaurant. I have to make this. Oreo fans would be craving 2nds and 3rds! This recipe is easy and a no-bake, which makes it so desirable to make. Anything cheesecake I’m an instant fan of. I’m also a huge fan of peanut butter. An easy no-bake cheesecake? I can’t wait to make it! It’s definitely time for me to make a delicious dessert like this. The toppings are looking too good. Oh my goodness! I love how creamy and mouthwatering this cheesecake is! I am drooling over it!